From Autumnal to Vernal Equinox, this is the Death In June Winter tree. Stripped bare, but for thirteen of its branches. 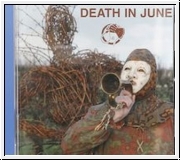 But they are as strong as ever, and with thirteen glasses and one last toast, this new album captures the true essence of Death In June, again setting new standards in its self-created genre. Let the Blackbirds kiss you and may The Rule Of Thirds dictate your life. Diesen Artikel haben wir am Donnerstag, 15. Juni 2017 in unseren Katalog aufgenommen.